"Group photo with the bishop"
Group photo with the bishop. From left to right, front row: Fr. Yao 姚;Bp. Joseph Fan (Fan Heng’an 范恆安); Fr. 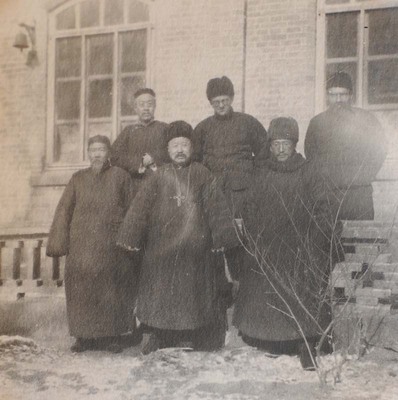 Pau Ing (Yin尹), rector of the minor seminary; back row: Fr. Tchang (Zhang張), pastor; Fr. Raymond de Jaegher, Fr. Jacques De Vigneron. Group photo with the bishop. January 21, 1934. Société des Auxiliaires des Missions (SAM) China Photograph Collection, Whitworth University Library, Spokane.